I know this review for the Sims 3: Generations expansion pack is coming in a bit late, but it took me longer to get a feel for this one than the previous expansions packs have. The additions aren’t nearly as drastic as some of the previous expansion packs. While World Adventures offered trips to foreign lands, Ambitions offered new jobs and careers, and Late Night offered new ways to let loose and socialize, Generations’ additions are much closer to the base game, building on the general goal for Sims to grow up, start a family and live out their lives. One of the most intriguing additions to the expansion pack is the scrapbook that keeps track of memories. Whenever something noteworthy (good or bad) happens, the Sim adds the memory to his/her scrapbook, which you can look through whenever you want. In addition to whatever the game decides is memory-worthy, you can also click the memory icon and create a memory manually. 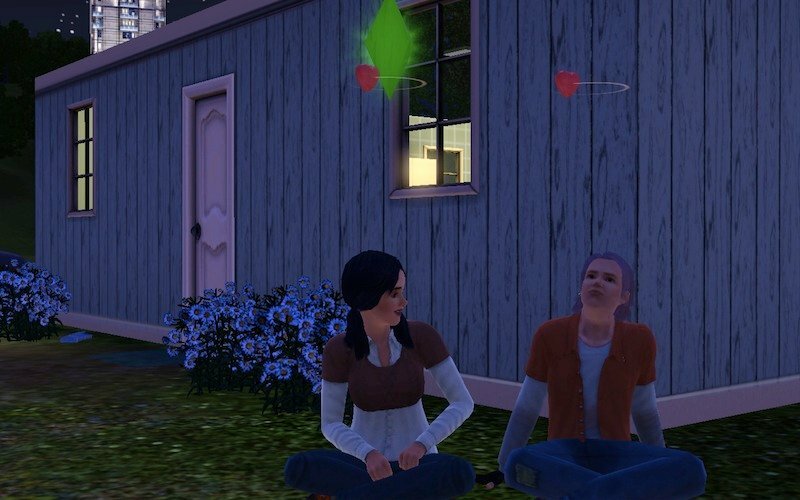 Some of the memories you might see are a new relationships formed, a skill point earned or something random, like the first time the Sim visits a certain place. Each time a new memory is recorded, the message box in the upper right corner makes a note of it. I turned the memory notifications off because they were cluttering up the notification box. You can now link your Facebook page and Sims3.com account to your game so that you can upload your memories to your FB wall or Studio with just a quick click of the mouse. 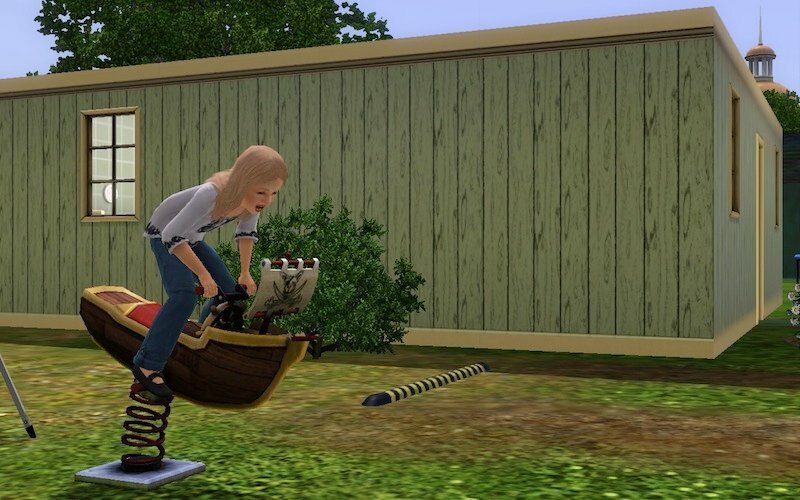 Doing this can earn you rewards from the Sims3.com store. 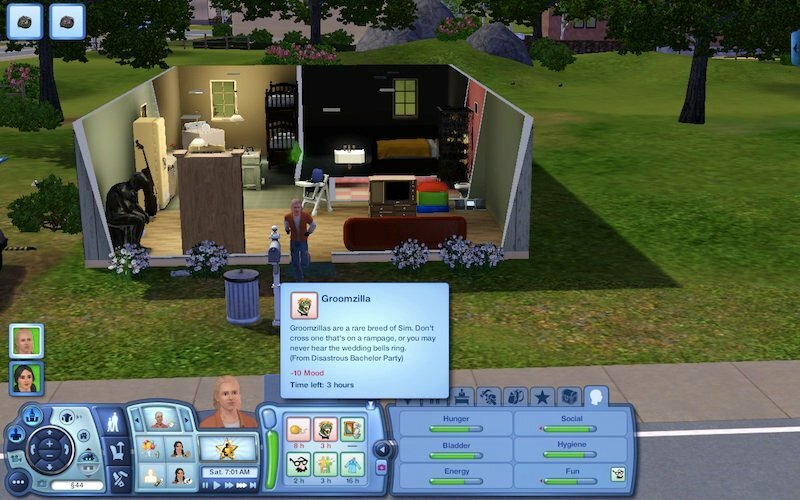 I shared a bunch of memories and got a new hot tub, a barbecue grill and a bookshelf that I was able to download and install into the game. (These items showed up in my account purchase history at TheSims3.com) While the sharing incentive is cool, I had some issues with this as sharing a memory would occasionally cause my game to freeze up. I had to force-quit whenever this happened, resulting in losing whatever I hadn’t saved and having to restart the game (which takes a while). Free items are great, but given how long it takes to save and start-up the game, they’re not really worth the hassle. Hopefully this bug will be fixed soon. 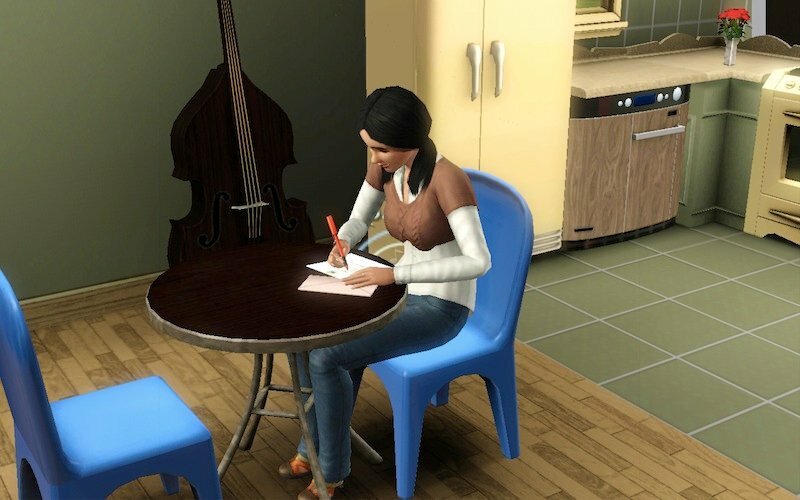 The scrapbook also documents the Sim’s current reputation, which is built based on their relationship history. Once upon a time, a Sim could have an affair that might go unnoticed. Now, Sims caught cheating will be branded as “naughty.” The reputation page keeps a list of the longest relationship the Sim has had and how many times they’ve cheated. No longer are male Sims stuck with the shaved Ken-Doll look. 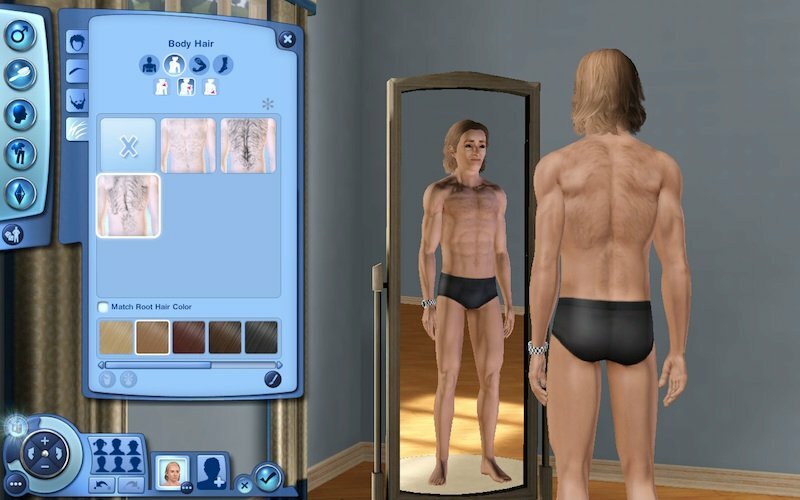 Create-A-Sim now gives you the option to get creative with male Sims’ body hair. 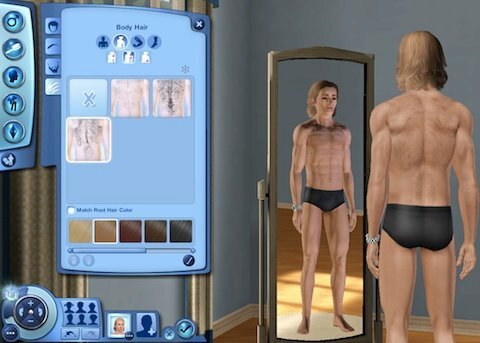 You have a few options for back hair, arm hair, chest hair and leg hair, all of which can be modified from the mirror in-game. The new traits are Nurturing and Rebellious. 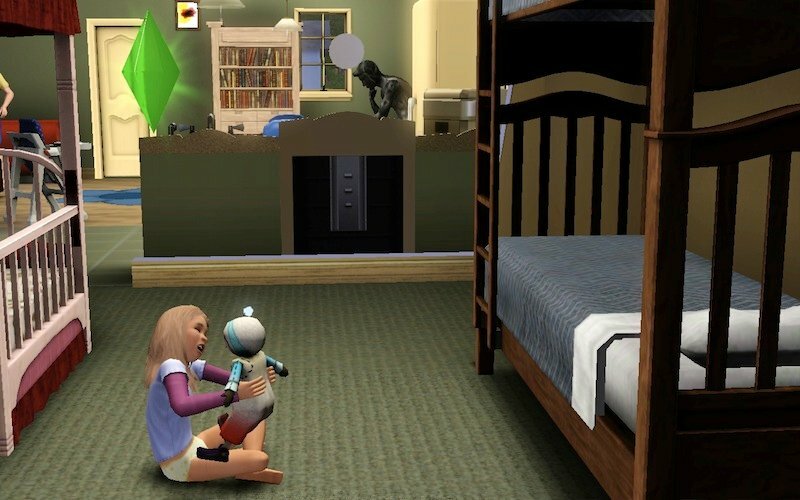 Nurturing Sims are better with kids and can discipline them for bad behavior. Rebellious Sims love getting into mischief. 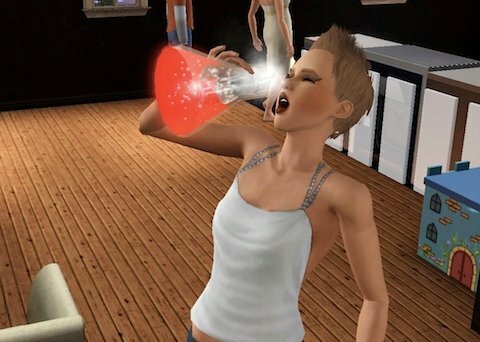 As Generations adds new pranks, like booby-trapping the shower head to dye someone’s hair or making a scary image appear on the computer, rebellious Sims have plenty of ways to act on their desires. Rebellious will probably pair well with Kleptomaniac and Evil. Generations includes a number of new Lifetime Rewards. 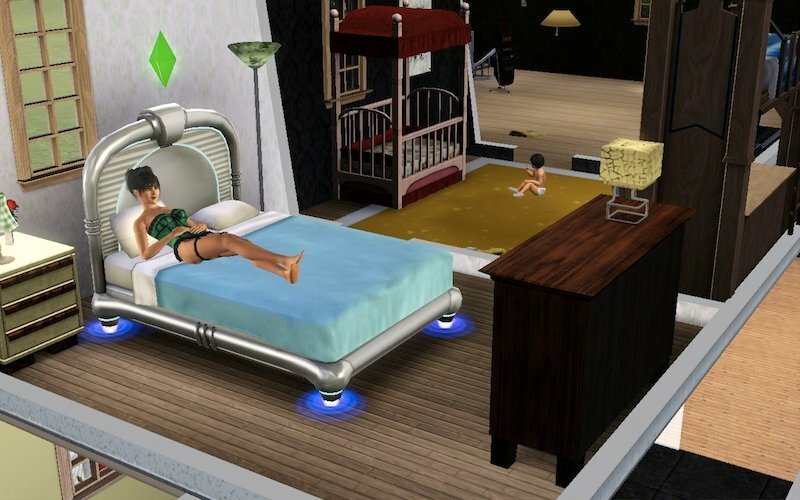 Sims can use their reward points on a futuristic-looking hovering bed (offers a positive moodlet for hovering while sleeping) or a strange looking van-like car that may boost your Sims motives (or keep them stationary) while en route. I haven’t really played with that one, so I can’t say for sure how well it works, but your Sim will be sacrificing style for comfort regardless as the thing is fairly ugly. 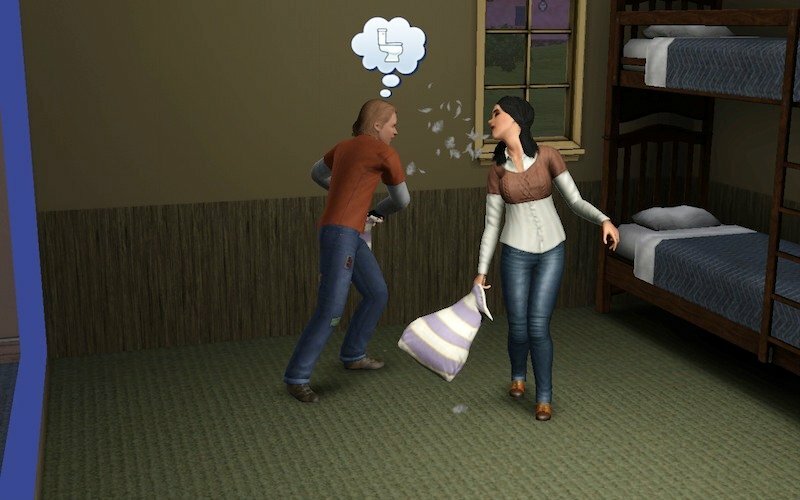 Sims with reputation issues can purchase the Clean Slate to clear the “naughty” behavior from their reputation, or Above Reproach, which allows some of their public displays of affection to go overlooked. The best of the new Lifetime Rewards are the Young Again potion, which ages your Sim down to a Young Adult again. The other option is the Aging Freeze potion, which will keep your Sim at their current age. 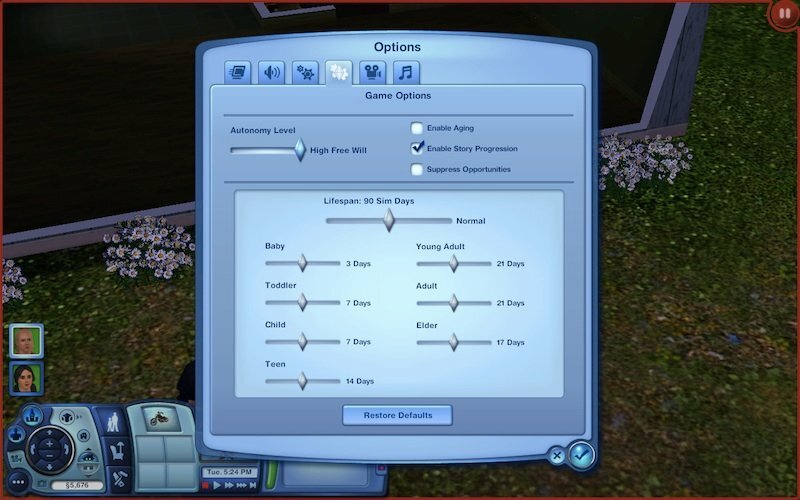 Between these and the much more advanced options for customizing how your Sims age in the game options panel, those of us who prefer a bit more control over how and when our Sims age up have plenty of ways to do it. 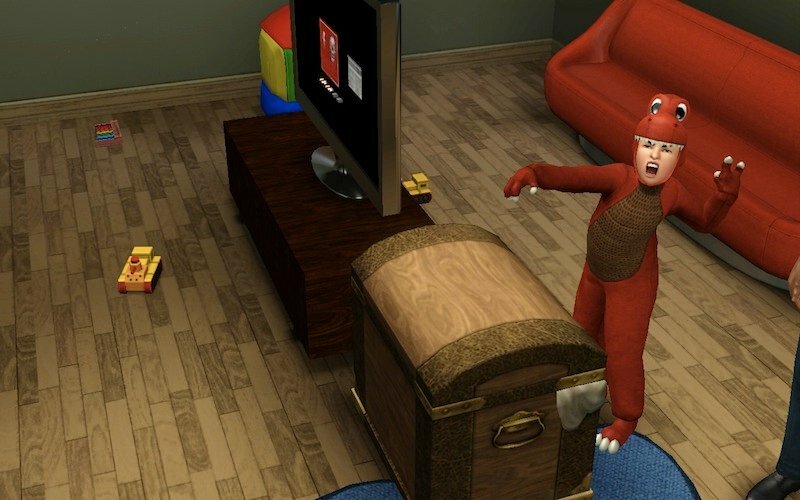 I’m not a fan of raising toddlers in the Sims game. 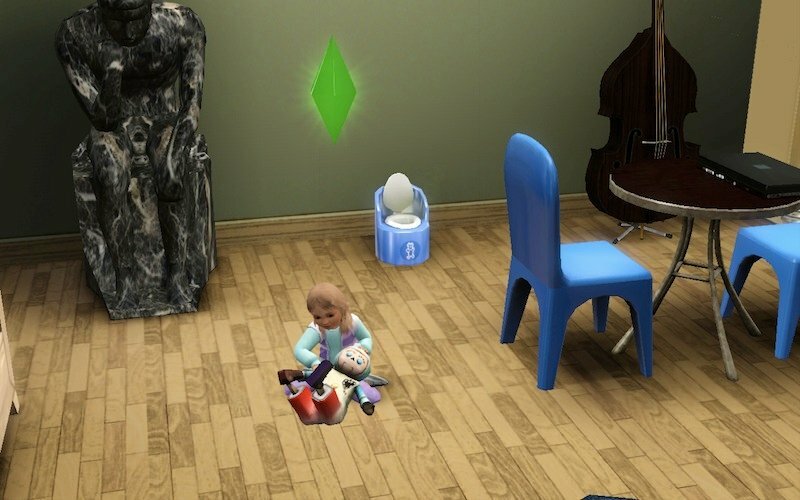 Teaching them to walk, talk and use the potty was fun way back when Sims 3 was new but it’s long since lost its charm on me. 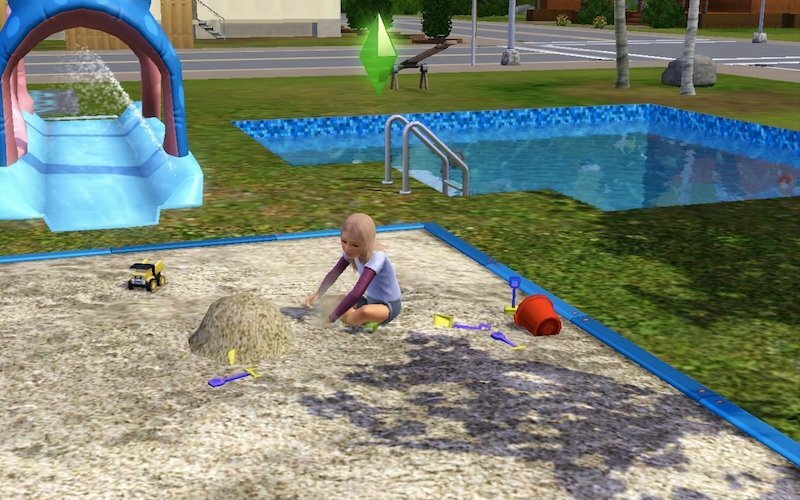 With that said, I’ve played the game long enough to feel comfortable knowing how to juggle multiple toddlers in one household and I actually thought the Daycare job option might be a fun way for my Sims to work from home. Not the case. A Sim who registers in a Daycare profession invites the neighborhood to drop off their toddlers for a few days a week. There doesn’t appear to be a way to control how many you take or what days you take them. That seems to be determined by what level you’re at in the profession and the job appears to only get harder the higher you advance. Mom or Dad stops by, drops off their kid and leaves your Sim and whoever else might be around to tend to their needs. My Sim and her husband had at least three babies dropped off and because none of them stayed happy for more than a minute (real-time), I spent the entire time they were there, clicking from one Sim to the next, trying to appease the screaming babies. 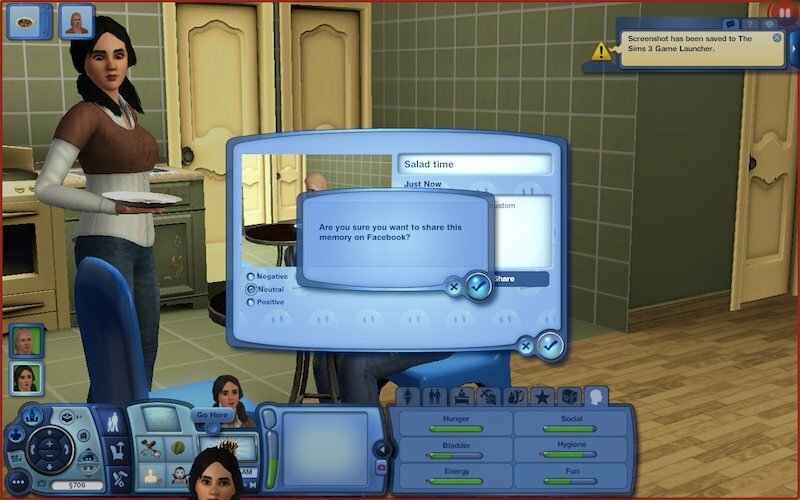 I did this with the cheat on to keep my own Sims needs static because there would’ve been zero time for them to use the bathroom, eat or anything else. Perhaps that’s sort of realistic in a funny way but for the tiny amount of money the Sims received for this service and the amount of effort it took to keep the babies clean, fed, cuddled and entertained, it wasn’t worth it, nor was it fun. Never again. 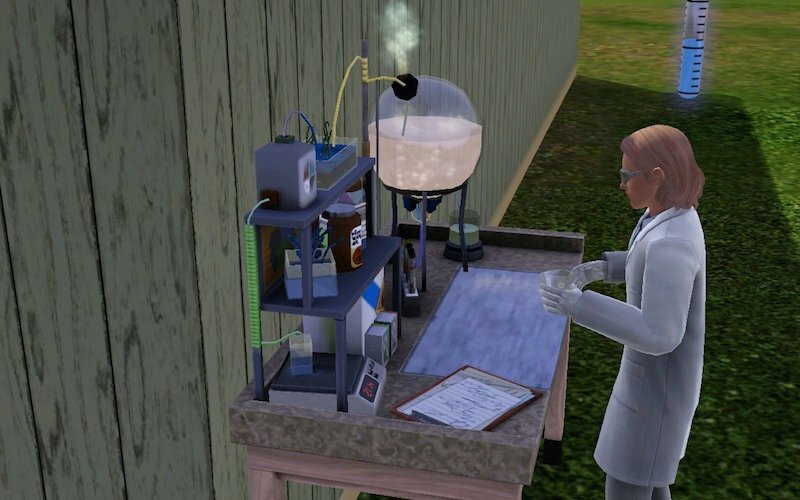 Sims can build their logic skill using the Chemistry station to make potions. 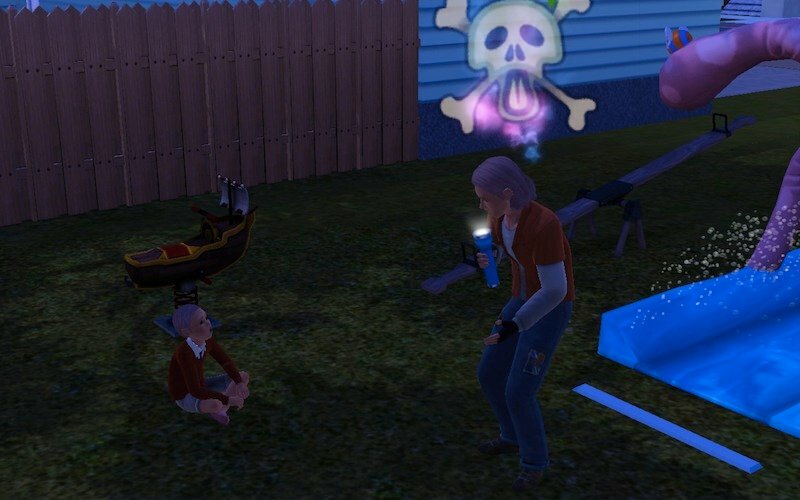 Some potions create fun, random effects like a stink potion to make people smell or a ghost potion, which temporarily turns a Sim into a ghost. The Young Again potion is also in there, as well as the potion to turn Imaginary Friends real (more on that in a bit). Sim children can build their skills by attending after school clubs. For example, a Sim that attends the Drama club may receive a boost to their Charisma. The Boarding School option is great for big families, especially if you grow tired of chasing after Sim kids to make sure their homework is done and that they’re working on their skill building. There are a number of different schools, each of which gives your Sim a boost to certain skills and future careers. Which school the child attends also affects the trait they receive when they age up. The prep school, for example, will result in the Sim acquiring the Snob trait. There’s also a military academy, a sports school, an art school, and a “Peace and Love” school. If you played The Sims 2, you may remember having to invite the headmaster over to schmooze him, impress him with food (turkey and lobster worked best) and your house, in order to get your Sim child into a private school. Getting a kid into boarding school is not nearly as challenging. All it takes is money. The tuition varies by school, but enrollment is as simple as having your Sim sign them up on their computer. I actually wouldn’t mind a little bit of a challenge, at least for the prep school, which costs the most money. When a child Sim reaches his/her teen years, you have the option to keep them in the boarding school or have them come home. The downside to boarding schools is that there’s no break from them. The kids go away and they don’t come back unless you pull them out of the school or they age up and graduate. So a child might age to a teen and have the option to come home but if you keep them in school, you don’t see them until they age up to adult. It’d be nice if the kids came home on weekends so you could work on their skills at home and see how they’re doing. 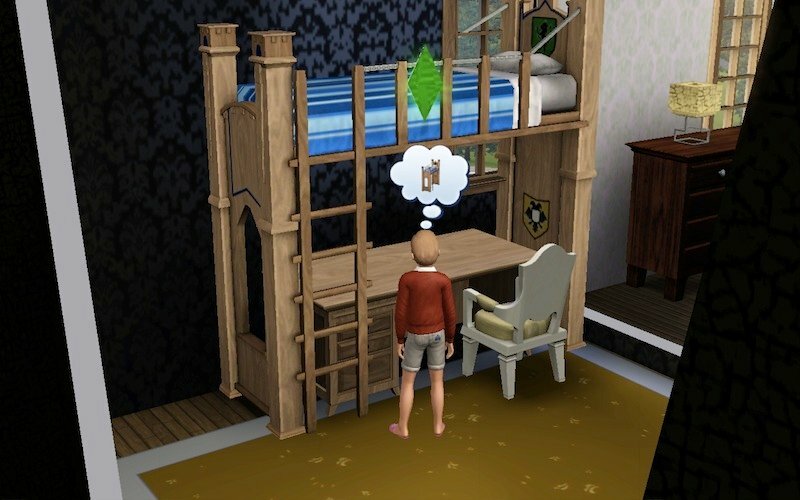 Sims can call the away-children to chat but other than that, they’re un-playable until they come home for good. 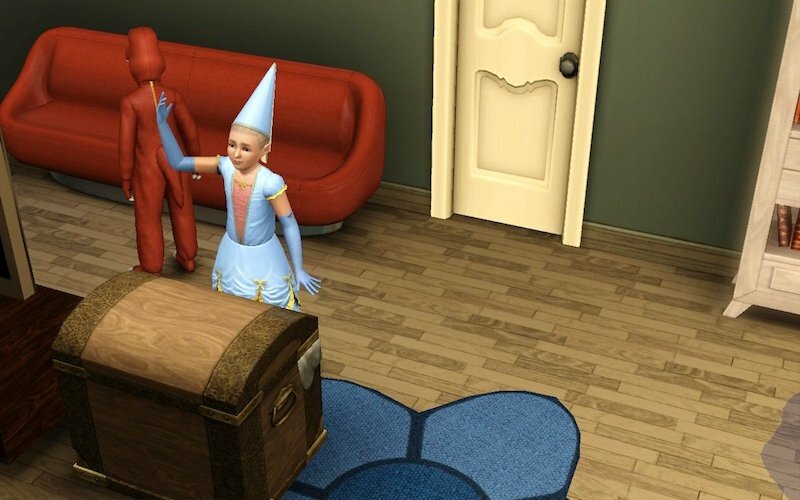 The new “creature” for Generations is an Imaginary Friend, which some Sim babies receive. The friend arrives by mail not long after the baby is born and appears in the Sim baby’s inventory. When he/she is a toddler, they can name it, sing to it and play with it. Giving an I.F. enough attention will result in it becoming a “living” Imaginary Friend when the toddler ages up to a child. The friend, is not playable at that stage and can not be seen by any other Sim other than the child that owns it. The child can interact with their I.F., playing games with it, asking it to do things and using it as a way to socialize. If the child becomes close enough friends with their I.F., they can turn it into a real child by feeding it a potion, which can be obtained by someone who knows how to make it from the Chemistry set or by an Opportunity presented by the science facility (this involves tracking down a rainbow gem and paying a hefty fee to the Science center). 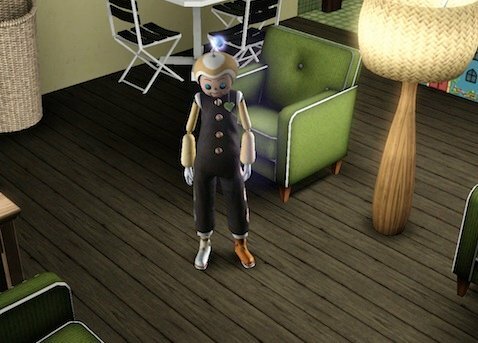 Turning an Imaginary Friend real makes them a regular Sim with a seemingly random appearance and some quirkier traits, which I suspect is the result of having spent their non-human days lingering around one person all day or as an inanimate doll. You can play them like any other Sim and they become a part of the household. It’s good to keep that in mind because if your Sim family is already growing pretty big, you might consider keeping the I.F. unplayable and thus, not requiring a bed or food or attention. Like with every Sims 3 EP, Generations didn’t run completely smoothly for me. It should be noted that I don’t use any outside mods or custom content. As mentioned earlier, I had issues with the game locking up when I tried to share memories. I also had some other glitches with the game. One family’s children never had imaginary friends. Another household froze up and became completely unplayable. This might have happened when the two oldest teens were supposed to age up and return from boarding school but as there’s no way to keep track of how old kids are when they’re away at school (apart from remembering to count the days from when you sent them away), I can’t say for sure. 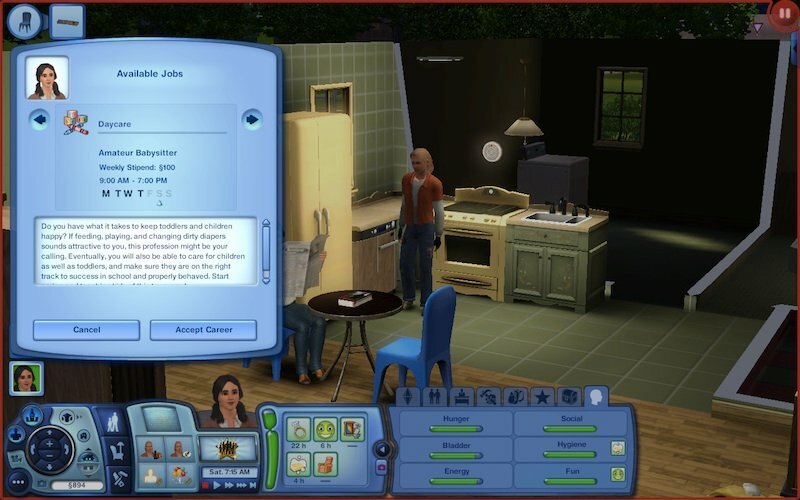 I had three failed attempts at bachelor/bachelorette parties and one mess of a wedding due to Sims getting stuck outside the house and refusing to let themselves in or get out of each others’ way. This isn’t a new issue for the game (for me, anyway) but it does mean I can’t really comment on the additional types of parties. I did see a man dressed like a firefighter arrive at a bachelorette party, and a woman dressed as a maid at a bachelor party but if they were supposed to do something aside from stand around with the rest of the guests stuck outside, they didn’t. Not being able to do anything with kids once they’re away at boarding school is one big complaint. Another is that there’s no new neighborhood. Considering we can’t customize the neighborhoods in the game as we could in The Sims 2, a new neighborhood is a big selling point for the expansion packs. By comparison to World Adventures and Late Night, both of which I would highly recommend to regular Sims 3 players, Generations feels a bit rushed and unfinished. With no new neighborhood and the new options feeling much more scattered than we’ve seen in previous expansion packs, I would’ve at least expected fewer glitches for the $40 price tag. With the above said, Generations does improve with age, which is fitting considering the theme. 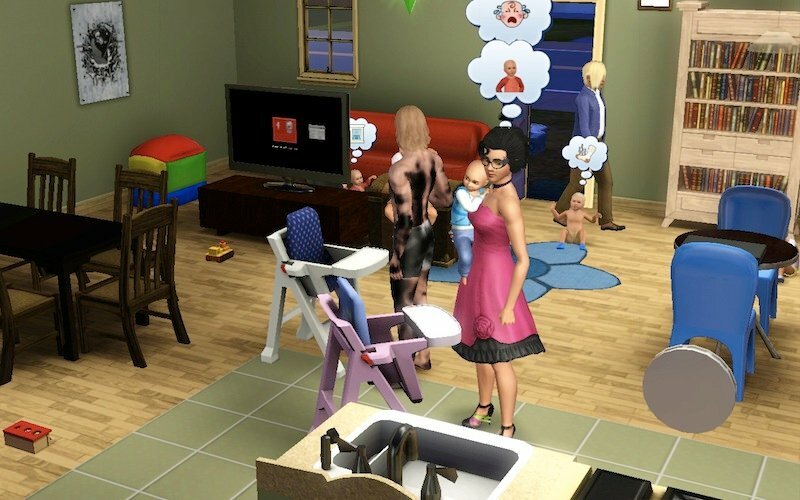 At first play, it might not feel like there are a lot of new features but as time goes by and your Sims age and start a family, you’ll begin to appreciate the add-ons and what they bring to the game. 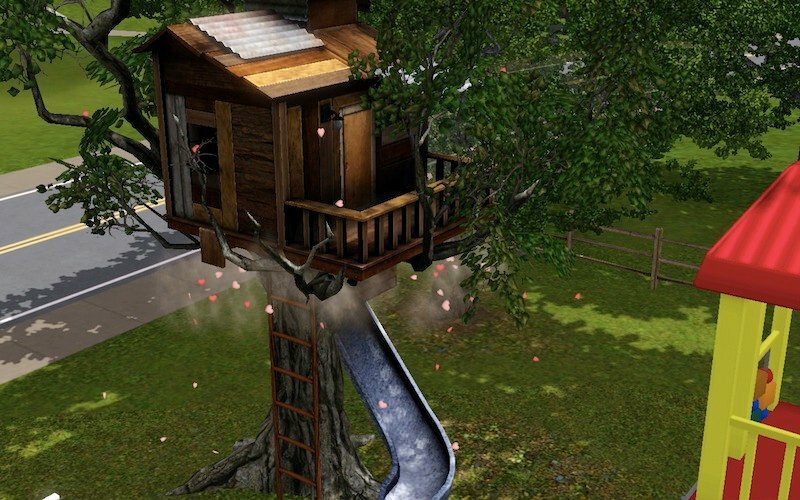 I wouldn’t rank Generations high on the list, but if you play The Sims 3 regularly, there are some added things that might freshen up the game for you. Plenty of new outdoor items including playground equipment, a water-slide, tree houses where kids can play and sleep, and adults can woo-hoo. There’s also a stroller to take babies and toddlers for walks. Teens can throw parties while their parents are away (the parents get an opportunity to disappear for a day or two). Teens also get the option to go to the prom. We don’t get to see them at the prom (rabbithole) but we do get to see them dressed up and headed off in a limo. If they’re crowned prom king/queen, they receive a crown in their inventory. Kids can be read to while in bed. They can also pretend to drive the couch and play submarine in the tub. There’s a costume trunk that allows children to dress up in costumes (dinosaur, princess, astronaut) and walk around as such. 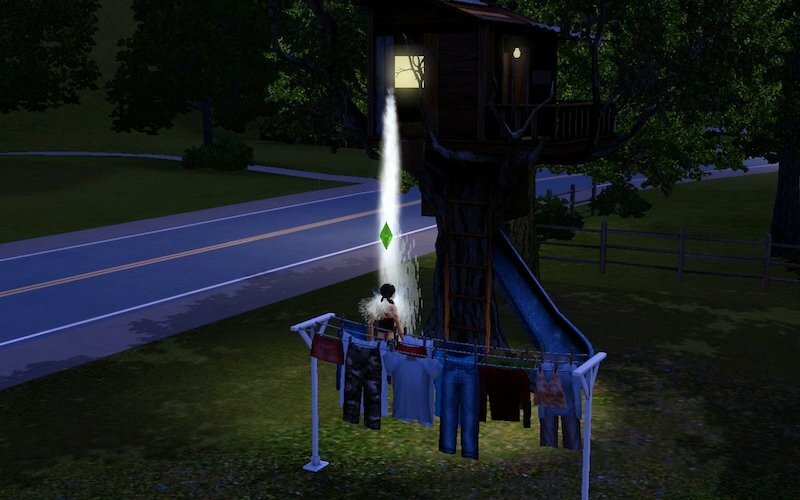 Sims can woo-hoo in the shower. Sims can give each other flowers (romantic) and gift items from their inventory. 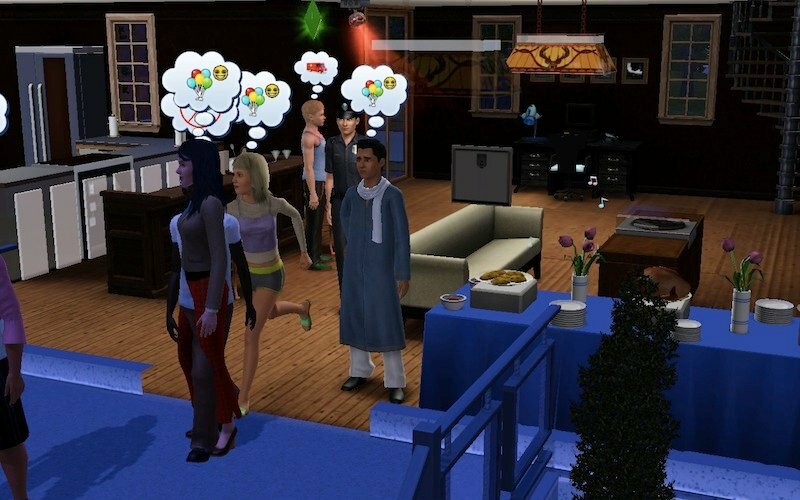 Sims can go on dates, which is similar to a group-outing but romance-themed. They can also sit outside and look at the stars together. There are bunk beds and a loft bed, which you can put a desk or dresser underneath to save space. 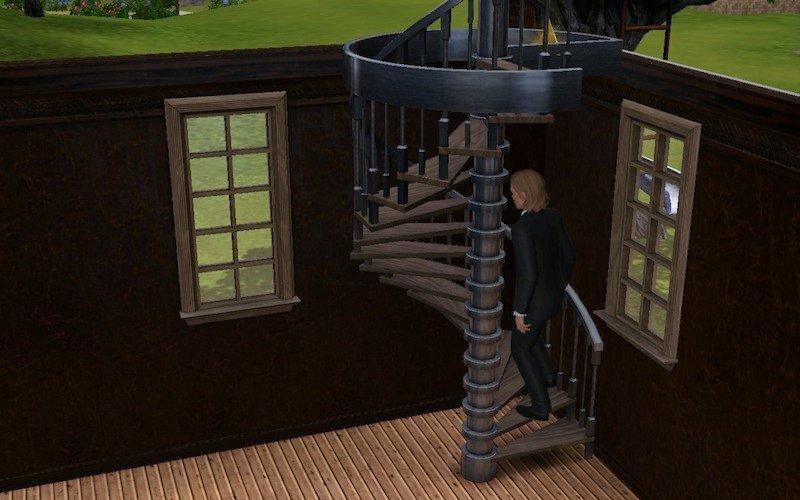 Speaking of saving space, there’s a spiral staircase, which takes up less floor space than a regular staircase might. Sims can purchase a video camera, which they can use to take videos and watch later on their TV. 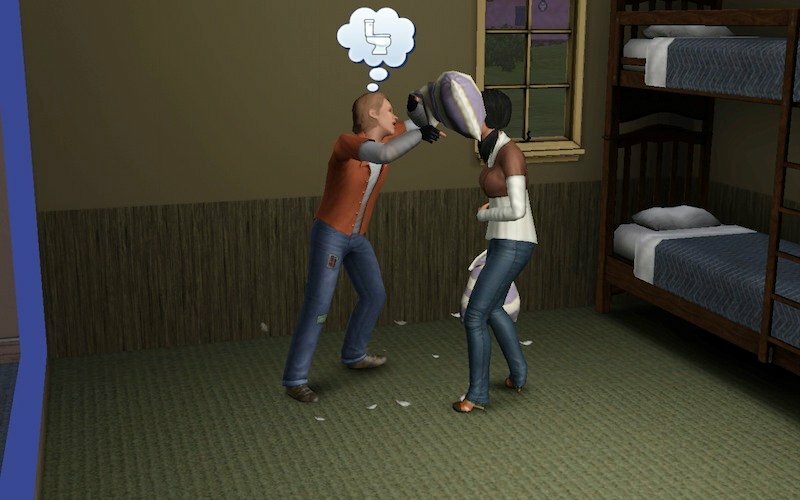 Sims can pillow-fight with each other for fun. There’s a wedding cake and wedding arches that can be used to dress up a wedding. Elderly Sims can walk with a cane and select from two different styles of cane-walking. 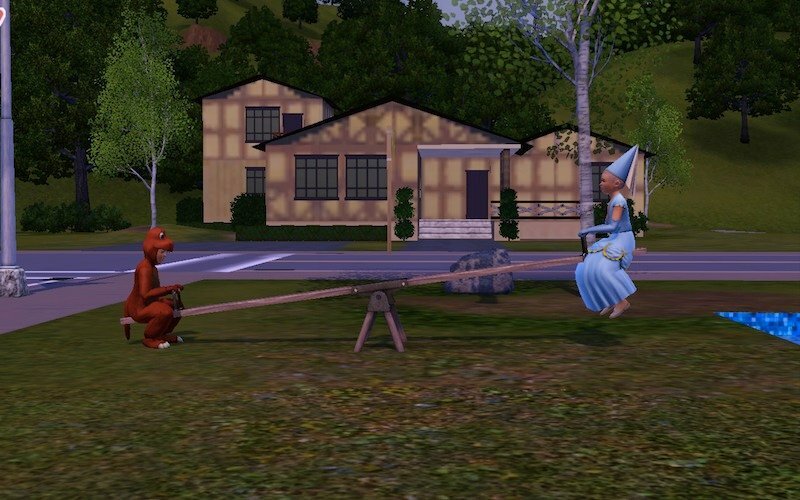 Imaginary friends walk with a strut and can continue to strut if they want even after they become a real Sim. Teens can ask their parents to learn how to drive.